An eerie, uncomfortable horror is creeping from PC over to iOS! The woods finally give in to the nightfall, and the dreadful things come out to play. - A game of survival and troubling madness. - Hide from the invading creatures. - Fix the lights and keep the cabin rooms repaired to ward off evil. - Survive the night with your sanity intact. 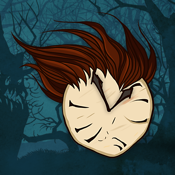 - Solve the mystery of the Lodgers nightmare. - Full iOS 7 controller support. Knock-Knock Game offers a survival horror story game full of creepiness and suspense.